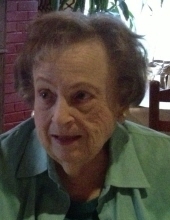 Faye Jewell Rials Marlow, 88, died Tuesday, February 12, 2019, at Tidelands Waccamaw Hospital in Murrells Inlet. Mrs. Marlow was born in Columbia, SC on April 20, 1930, the daughter of the late Walter Talmadge Rials and Janie Mae Hood Rials. She was a graduate of Columbia High School in Columbia, SC. and after moving to Pawleys Island became a 70-year full time resident of the island. Along with her husband, Frank Marlow, she was the owner and operator of Marlow's, a general mercantile store at Pawley's Island, until they retired in 1988. Mrs. Marlow served as a president of the Eastern Star and was a communicant of All Saints Church, Waccamaw serving on the vestry, in the choir and on the archives committee. She also attended Christ the King Waccamaw Episcopal Church. Mrs. Marlow loved traveling, chatting with people and enjoyed going out to dinner, especially at Frank’s Restaurant. Surviving are her daughter, Leslie Gail Marlow-Inman and her son in law, Marvin Duane Inman of Rome, GA, many nieces including Patsy Burns Kornharens of Summerville, SC, Bobbie Burns Hawkins of Columbia, SC and Kristi Kornharens of Fort Mill, SC and a nephew, Daniel Rials of Columbia, SC. Memorial services will be Saturday, February 16, 2019, at 2:00 pm at the graveside in All Saints Church, Waccamaw, Churchyard. Officiating will be Tim Surrat. Inurnment will follow under the direction of the Georgetown Chapel of Mayer Funeral Home. In lieu of flowers the family requests that memorials be made to Martha’s House, PO Box 434, Georgetown SC 29442, Miss Ruby’s Kids, PO Box 1007, Georgetown, SC 29442, All For Paws, 708 Petigru Dr., Pawleys Island, SC 29585 or Teach My People, 753 Waverly Road, P.O. Box 2848 Pawleys Island, SC 29585. To send flowers or a remembrance gift to the family of Faye Jewell Rials Marlow, please visit our Tribute Store. "Email Address" would like to share the life celebration of Faye Jewell Rials Marlow. Click on the "link" to go to share a favorite memory or leave a condolence message for the family.